CULLMAN – Cullman Christian School (CCS) is a school on the go, and not always by its own choosing. Originally housed at Eastside Baptist Church, it saw its facilities destroyed along with the church in the 2011 tornado. In the wake of that disaster, Seventh Street Baptist Church graciously opened its doors; and CCS moved across town to a temporary home that it still occupies today. The staff and faculty of CCS are grateful for the help they have been given, but even as far back as their Eastside days they have looked forward to the day when they can ring the morning bell in their own schoolhouse. That day is getting closer, and folks are beginning to see the future peeking over the horizon. The school has already acquired 12 acres of land along Golf Course Road near Cross Creek Country Club, and has embarked on a capital campaign to fund the construction of a facility on the site expected to cost just under $6 million. CCS has retained the services of architect Jock Leonard of Leonard Designs, and plans to bid out the construction contract. 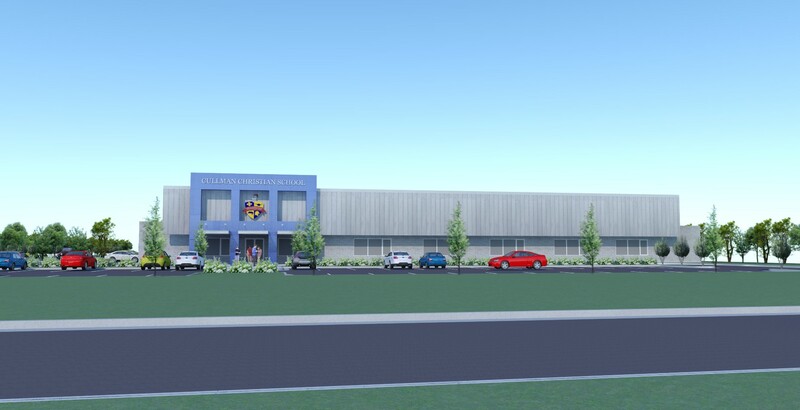 If the capital campaign is successful, they will break ground in 2019 and move into the completed facility in time for the 2020-21 school year, following the end of their current agreement with Seventh Street at the end of the 2020 school year. Phase one of the construction project will be the 23,800-square foot academic building, at a projected cost of around $3.6 million, including furnishings and equipment. The facility will include 16 technologically up-to-date classrooms, a library, computer lab, science lab, dining room and kitchen. Phase two will see the construction of a 15,960-square foot gymnasium at a projected cost of just less than $2.4 million. The building will include a multi-use basketball court/recreational space, training space and locker rooms, offices and storage rooms. The two buildings and surrounding improvements (parking, landscaping, etc.) are expected to cover approximately 3 acres of the 12-acre site, leaving plenty of room for the development of playgrounds and athletic fields, and potential future facility expansion. At its present site, CCS is currently enrolling students in all grades K-12 for the 2017-18 school year, with part-time enrollment available to area homeschool students who would like to be involved in school athletics. The school is also offering fast track enrollment for high school students who would like to pursue college credit while still in high school. For more information, visit www.cullmanchristian.org or www.facebook.com/Cullman-Christian-School-117448243533/.